Last year my favourite editor announced she was releasing a diary documenting the year that was Vogue's centennial. The editor in question of course is Alexandra Shulman, the soon to be outgoing editor of British Vogue, although more on that another time. Longtime readers will know British Vogue is one of my all-time favourite magazines, if not my favourite title under the Vogue umbrella. I am also sure it is no secret to anybody that I love magazines. Always have. Always will. Inside Vogue was one of the books I picked up on my trip to Melbourne after many, many laps around the bookstore and it kept me company for many days after. This diary was penned by Shulman from June/July 2015 through to July of 2016. In it, she documented the centenary year as well of course as the centennial issue of Vogue which believe it or not was being planned a year out. As well as the comings and goings at Vogue, she writes on the BBC documentary crew who filmed the British Vogue team and of course aspects of her rare downtime from what is quite simply, a massive job. People like to trivialise fashion and fashion magazines but really they are works of art. So much goes into the crafting of each issue and many of the themes and ideas for issues take months of preparation. They really are true labours of love. Case in point: the Kate Middleton cover was a huge secret, maybe four or five members of the Vogue team knew about it and everyone else was left in the dark. Alex's writing is so refreshing. That's the best way to describe it really. Having read this book twice now, one for another review actually, that is the one thing that has stayed with me. Looking at it again now it almost seems foreshadowing in some ways and hinting that Alex was ready to leave British Vogue on a high note after such a monumental year and countless achievements and successes. Perhaps I am reading too much into it but there are definitely hints that seem to insinuate she was ready to pursue other projects and life after Vogue. For magazine lovers and true enthusiasts, you will appreciate the many insights into the workings of the magazine. I always knew they were a lot of work but you just don't realise how far in advance stories are planned and covers are orchestrated. That and just how tricky some people can be to work with. You have to have a great deal of patience really. There are also plenty of Alexa references in amongst the pages to keep me happy. I call myself a Chung connoisseur but even I didn't know she was one of British Vogue's contributors. As is Kate Moss, who knew? The Vogue team also were lucky to watch The Crown's rushes well in advance and they had a story in one of their issues last year, well before it made its way onto Netflix. I really do not want to spoil this book too much for anybody wanting to immerse themselves in its pages but for British Vogue lovers, magazine enthusiasts and anybody with an interest in Vogue and its inner-workings, you need to read this one. I will definitely be re-reading it again but I am also, not-so-secretly hoping Alexandra releases a further volume or book of anecdotes and musings from her time at the magazine. 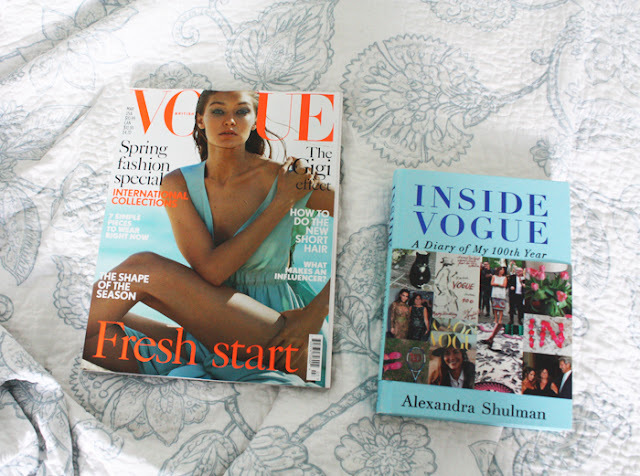 -Have you read Inside Vogue? What did you think of it?